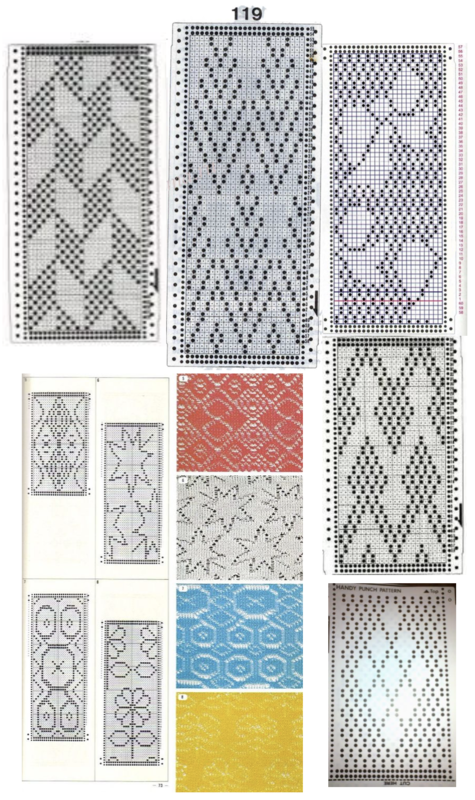 The inspiration fabric led to ideas for recreating it on a punchcard machine, and my own trip down that rabbit hole led me to thinking about the relationship between tuck stitch designs and thread lace ones. 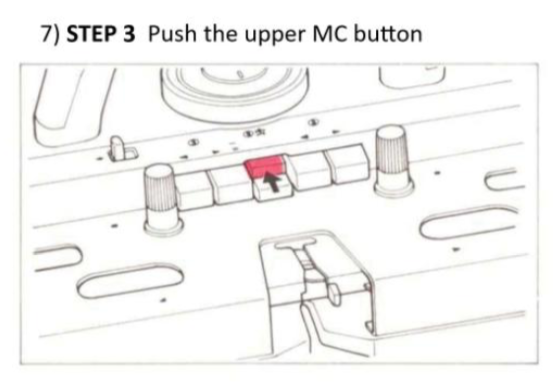 Studio manuals refer to the fabric as “punch lace”. 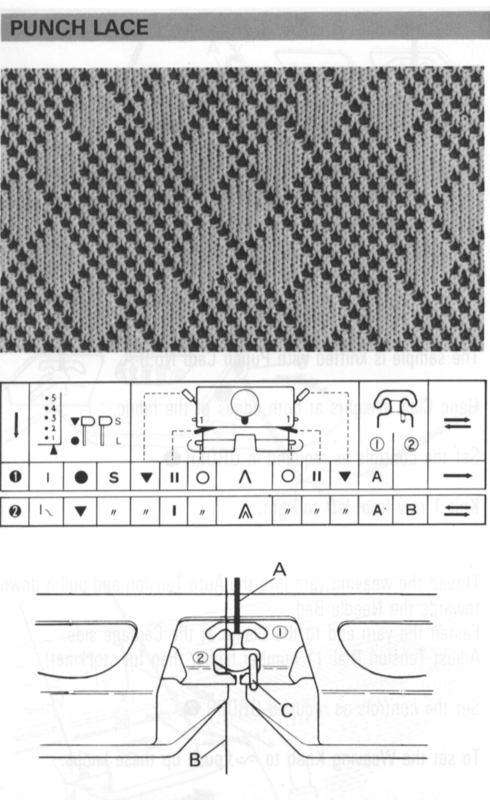 Early pattern books including ones for electronic machines provide a large range of pattern repeats for such fabrics, and can be design sources for other knit stitches if one understands the structure being created. 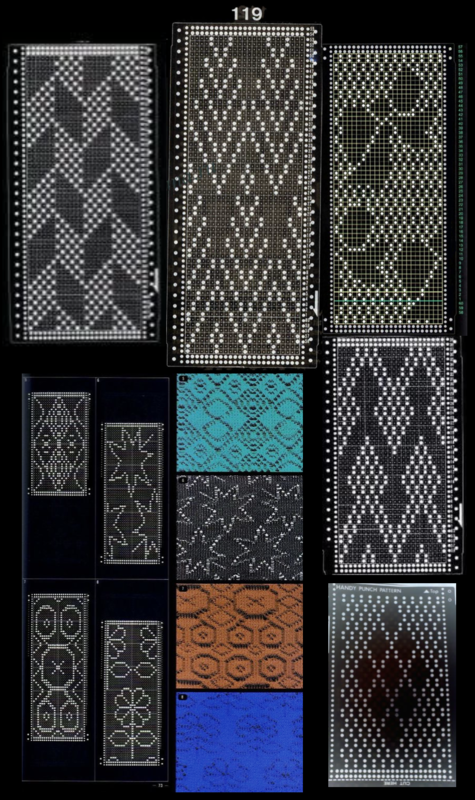 In tuck stitch the unpunched areas, white squares or pixels represent loops created on non selected needles, punched holes / black squares or pixels represent knit stitches. 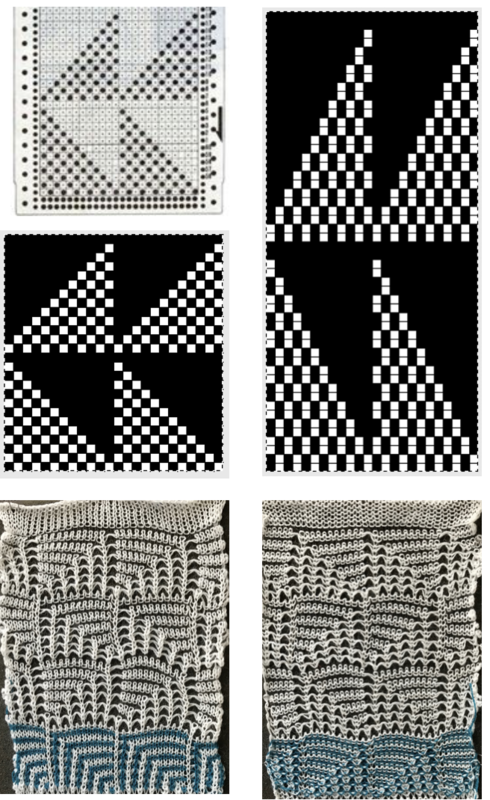 In punch/ thread lace those white areas knit both thick and thin yarns together, while in punched holes/black square or pixel areas the thin yarn knits on the stocking stitch side of the fabric, with the thicker yarn floating behind it. Depending on fiber content, gauge, etc. the illusion of eyelets can be created. 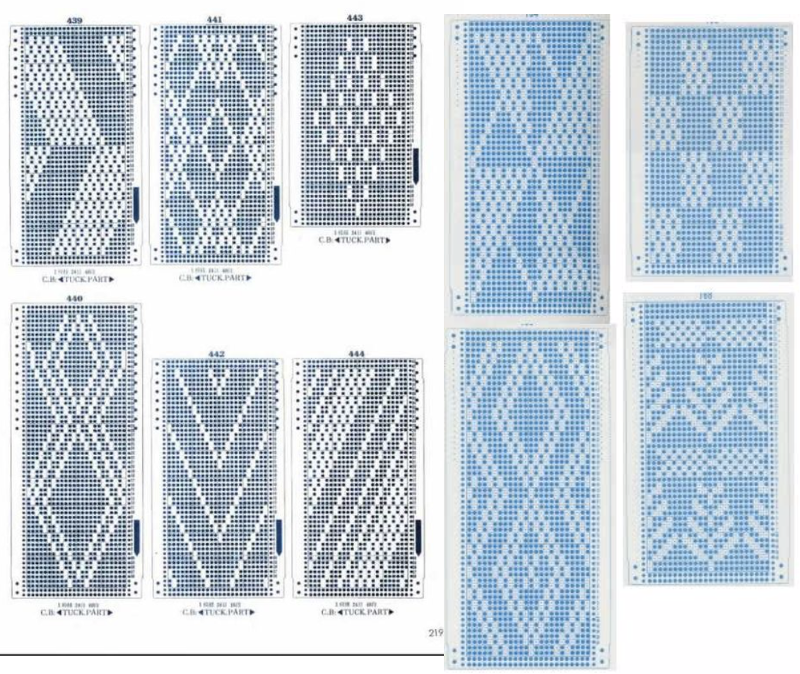 This is half of a Brother punchcard repeat, suitable for thread lace, reworked for knitting the design in tuck stitch. That is in turn doubled in length to allow for color or yarn value changes occurring every 2 rows. The resulting swatch is tested first in 2 colors to proof the repeat, then using clear serger thread as one of the 2 “colors” for a very different effect that blends that of both fabrics. published tuck stitch cards For DIY a place to start is with simple color reverse punch lace to tuck test. Not suitable are any areas with lots of side by side white squares. 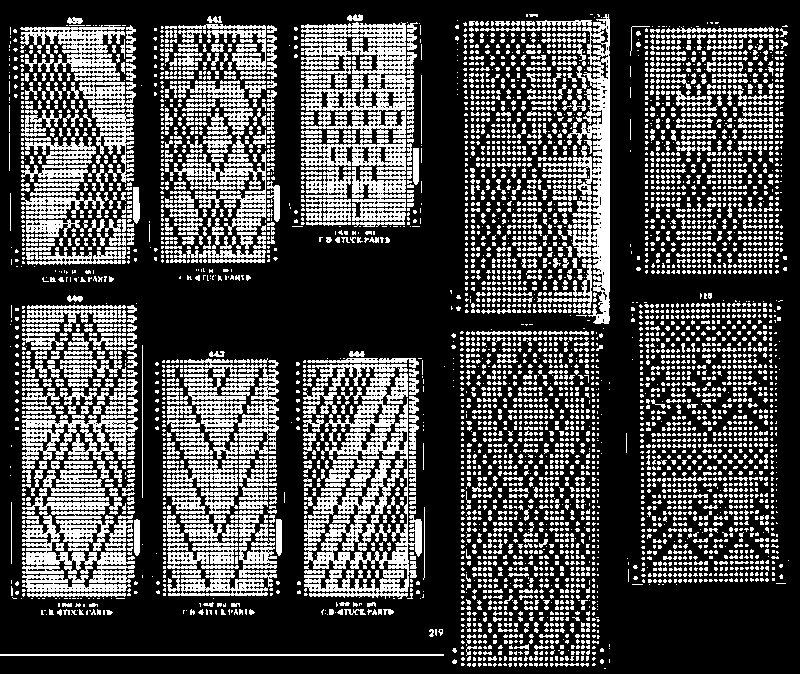 In the bow solid lines those could be modified, most of the repeats in the colored swatch segments of the published charts are unsuitable. 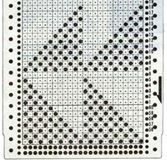 Once the chosen repeat is isolated, the punchcard can be further edited for electronic knitting. 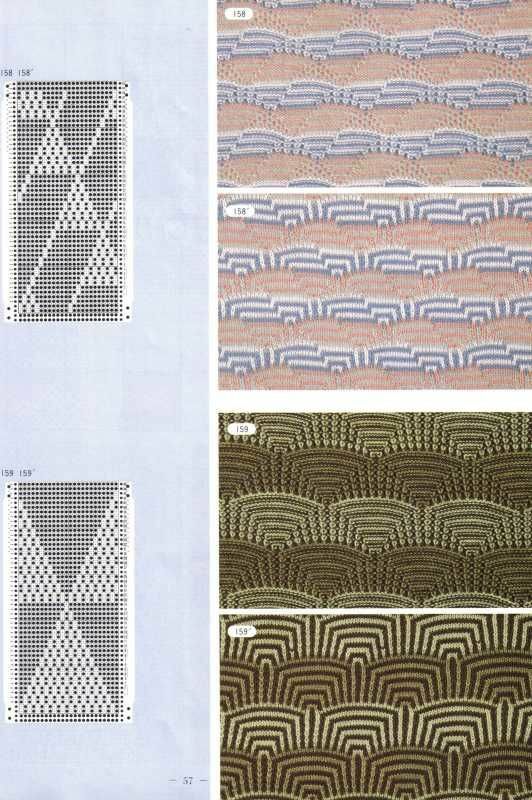 Tuck to punch lace: any of these would be worth a test, some results may be very subtle. 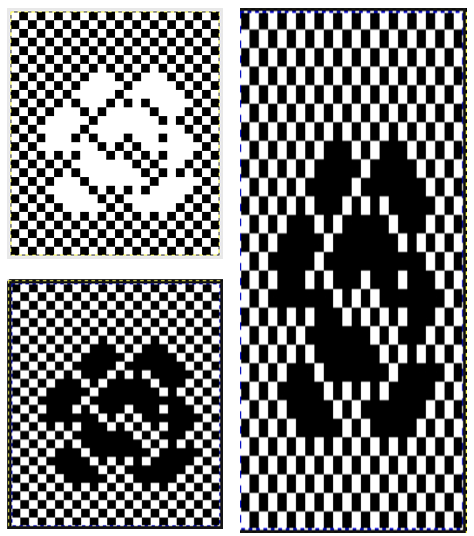 From punchcard repeat to electronic: strong black and white images that have punched holes represented as dots may be the hardest to process quickly in Gimp. It is best to isolate the single repeat. Some clean up of the gridded image may be required. Test the latter by tiling it. 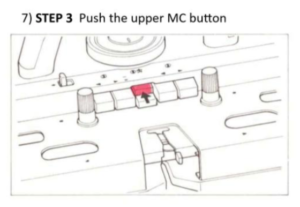 Color reverse the single it if that is the original goal, using built in function in electronics or punching black squares in cards.